Incanha Intumbo was born in Guine-Bissau and grew up speaking both the Portuguese-based Creole and Balanta, an African language belonging to the West Atlantic family. He received his education in standard Portuguese from Italian missionaries who taught him their language and Latin. They were interested in using the Creole in education, and described the language in dictionaries and other publications. Later Incanha Intumbo taught the Creole to American Peace Corps volunteers, and learned English in the process. He did his licenciatura at Coimbra University in Portuguese and French and developed an interest in linguistics. 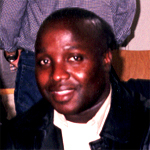 In 2003 he attended a meeting of the Associacao: Crioulos de Base Lexical Portuguesa e Espanhola (ACBLPE) at the University of A Corunha in Spain and decided to do a master’s degree in descriptive linguistics, comparing the grammar of Guinean Creole with that of Portuguese and Balanta in his master’s thesis. In 2004 he wrote a paper for the ACBLPE meeting in Curacao comparing the grammar of the noun phrase in Guinean Creole with that of Papiamentu, the Creole based on Spanish and Portuguese spoken in Curacao; it was published as an article in a Spanish linguistics journal in 2006. In 2005 he received a travel grant to Germany to present a paper at another international conference at the Max Planck Institute in Leipzig. The same year he presented a paper on the sociolinguistic situation in Guine-Bissau at the meeting of the ACBLPE at the University of Orleans in France. In 2006 he presented a paper comparing the verb phrase in Guinean Creole, Balanta and Portuguese at the Coimbra meeting of the ACBLPE. In June, 2007 he is presenting a joint paper with John Holm on the sources of Guinean Creole grammar at the meeting of the ACBLPE at the University of Amsterdam in the Netherlands. During the year of 2006 Incanha Intumbo worked on his master's thesis, Estudo comparativo da morfossintaxe do crioulo guineense, do balanta e do português, under the supervision of Professor John Holm at the University of Coimbra. Incanha successfully defended his thesis in 2007. -. Intumbo, Incanha. 2004. Papiamentu, Guiné-Bissau Creole Portuguese, and its substrate, Balanta: a comparison of the noun phrase. Paper presented to the Associacao: Crioulos de Base Lexical Portuguesa e Espanhola, Curacao, Netherlands Antilles. —. 2005a. Balanta, Guiné-Bissau Creole Portuguese and Portuguese: a comparison of the noun phrase. Paper presented at the Conference on Creole Language Structure between Substrates and Superstrates, Max Planck Institute for Evolutionary Anthropology, Leipzig, Germany. —. 2005b. Multilinguismo, Diglossia(s), e Planeamento Linguístico na Guiné-Bissau. Paper presented to the Associacao: Crioulos de Base Lexical Portuguesa e Espanhola, Universite de Oreans, France. —. 2006b. Crioulo guineense, balanta e português: estudo comparativo do sintagma verbal. Paper presented at the meeting of the Associação: Crioulos de Base Lexical Portuguesa e Espanhola, Coimbra. —. and John Holm. 2007. Quantifying Superstrate and Substrate Influence. Paper presented to the joint meeting of the Associaç?o: Crioulos de Base Lexical Portuguesa e Espanhola with the Society for Pidgin and Creole Linguistics, U. of Amsterdam. —. 2007. Estudo comparativo da morfossintaxe do crioulo guineense, do balanta e do português. Unpublished master's thesis (Faculty of Arts of the University of Coimbra). —. forthcoming. Balanta, Guine-Bissau Portuguese and Portuguese: a comparison of the noun phrase. In Susanne Michaelis, ed. Roots of creole structures. Amsterdam, Philadelphia: John Benjamins.